I hope everyone had a wonderful weekend. Last week I finally had the opportunity to try a new recipe. I ended up making a chicken and mushroom dish that my family loved. I can't wait to share the recipe with you guys. This past weekend we didn't do much. I did create an Easter basket for the kids and my mother. I didn't host Easter Dinner this year. Looking forward to our next family dinner though. Anywho, how was your weekend? What's on the menu for today? Chicken and Mushrooms sounds good! I did host our family Easter dinner for 16. I do so every year and love every minute of it. We had an egg hunt for the kids too. We do a lot of chicken dishes for meals as well. The weather is getting warm to grilling out is starting to happen at our house. Ugh, I need to make up a menu since I'm headed to the grocery store today. We have a lot of chicken dishes too. Today I'm picking up a rotisserie chicken because I am in no mood to cook. I am done with my menu until Friday. Tonight is leftovers from Easter dinner. Unless hubby still wants pizza, then we will do takeout. I am so jealous you are so organized and have your meals so well planned out. I need to follow your lead, and not get takeout so much. I want to start meal planning more often. I love your menu for the week. Ziti with garlic bread sounds absolutely delicious. Everything sounds amazing. 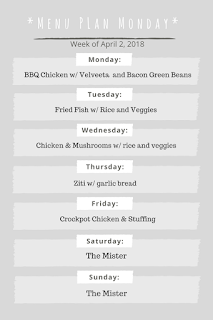 I love that you're making a meal plan every week, it really helps keep track of what your family's eating. I might have to copy this menu! I love every meal you have planned for this week! Loving your meal plan for this week! It's really nice to have some variation. 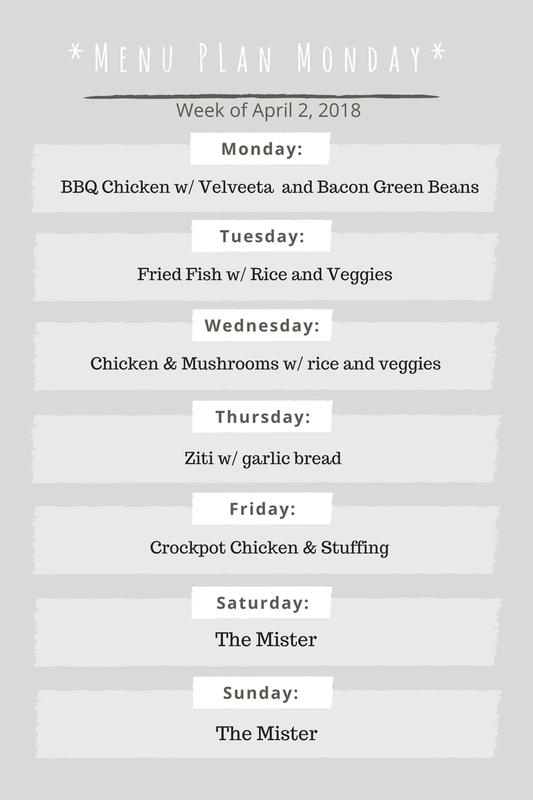 Thanks for sharing your meal plan ideas for the week! I hope you had a lovely weekend with your family as well. I've gotten used to making meal plans because of the diet I'm following. Love this meal plan! Meal plans, I haven't done that in years. Really should start doing them again as I got back into the healthy eating again. Chicken is my favorite meat to cook. Your chicken and mushroom with rice menu sounds delicious, I think I will make a similar dish today. A weekly menu is a great idea. This is something we have been wanting to implement for some time, but have never come around to it. Hope to take a cue from you and do it now. I've been trying to keep the carbs out of dinner lately, so our meals are typically veggies, Salad with egg, and either Chicken or Venison. I absolutely love Ziti! I need to add it to my menu next week. I had forgotten about it! You've some really great healthy meals planned for this week. I have no idea what ziti is - I've never heard of it. I have to look it up! What's The Mister? Good job on your Menu Plan this week. This sounds a lovely suggestion for Moms like me who's having a hard time thinking on what dish should I cook.